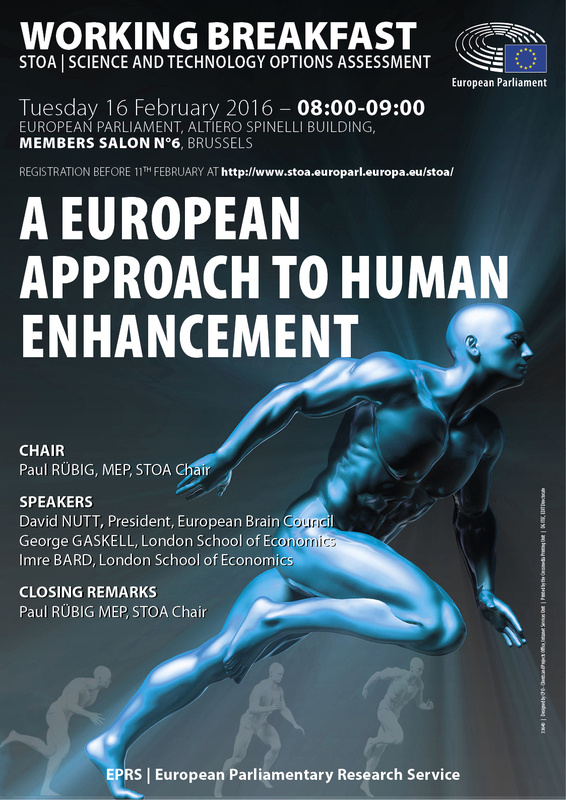 On 16th February 2016, the European Parliament Science and Technology Options Assessment Panel (STOA) pannel in cooperation with the European Brain Council organised a ‘Working Breakfast – A European Approach to Human Enhancement’ at the European Parliament. The meeting was organised in the framework of EU funded project NERRI (Neuro-Enhancement: Responsible Research and Innovation). Paul Rübig MEP, STOA Chair welcomed participants and talked about STOA main streams of work – sustainable mobility, sustainable resources, ICT and perfect life. David Nutt, President at European Brain Council, introduced the Council and its main objectives. 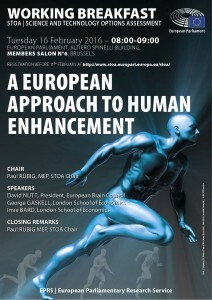 Imre Bard, London School of Economics, walked participants through a number of relevant reports such as neuro-enhancement (NE), including a STOA report from 2009. One of the main conclusions stemming from these reports is that the normative framework is missing. This has been one of the key goals that NERRI project – an EU funded project looking at “Neuro-enhancement; Responsible Research and Innovation” has been trying to achieve. He then went on describing project outcomes resulting from a number of mutual learning exercises that project partners conducted with various target groups such as patients, military, students, industry, doctors and researchers. In general, three main approaches towards NE prevailed: the minority would say that it is wrong, while majority was split between: i) those in favour of status quo – individual achievements should be most important, NE should be applied only in the context of restoration, social cohesion should be taken into account; ii) the most open group seeing NE as an expression of how technology can serve human potential. In general, there was a consensus among these groups regarding issues such as a preference towards using NE for treatment rather than enhancing healthy individuals, regulating the filed as well as protecting minors. The findings will be further distilled with a help of a social survey that is being currently carried out. George Gaskell, London School of Economics, continued describing project outcomes and made emphasize on distinction between restoration and enhancement. This has been a topic that resonated with the public and has policy implications. One of the basic questions re NE were: “Is it safe” and “Does it work”. Issue of funding surfaced as well – big pharma is not particularly interested in funding NE research. Another finding emphasizes importance of values and societal balance with questions such as: will NE create more competitiveness, how it can affect social solidarity and cohesion. Education is seen by many not only as learning but character building and acquiring a moral compass and this should be taken into account in NE discussions as well. Some experts believe that NE field should be regulated just like medical devices and drugs, as well as food claims. He also reemphasized earlier point regarding children as there seemed to be a clear consensus on not involving children – this topic should be stringently oversighted by public authorities. Prevention could be a good angle to get public option more in favour of the issue. D. Nutt agreed that un-doubtfully it could help, especially in view of prevention being very cost effective, including restorative side. Questions around consciousness and bio-ethical issues have been raised. EBC included the topic of consciousness as one of the recommended brain research areas in the Consensus Statement on European Brain Research that will be launched in March 2016. Focus on children has been discussed. It is a historically re-enforced focus as children has always been a very specific part of public imagination about protection and vulnerability. In the future the real challenge will be in making self-interested and optimal decisions. The question arises on how we can cope with it with the rapid development of technologies. We should get better prepared for these massive changes to society.